The Octavia Project, a free summer program that uses science fiction and fantasy to teach 21st century skills to underserved Brooklyn teenage girls, announced today that they will be funded by VanderMeer Creative for one year. VanderMeer Creative is run by editor Ann VanderMeer and author Jeff VanderMeer. Along with the announcement of their fiscal support of the Octavia Project for 2016-2017, VanderMeer Creative is offering an all-expense paid scholarship (including air travel) to one 2017 Octavia Project participant to attend their summer writing intensive Shared Worlds at Wofford College in South Carolina in 2018. Named after science fiction author Octavia E. Butler, the Octavia Project is delighted with the support of the VanderMeers, who have been champions of the program since its inception. “Now in our third year, this sponsorship means we will have more time to create dynamic summer programming and get the word out to even more girls. It’s a dream come true at this stage in our development.” said co-founder and director Meghan McNamara. McNamara also spoke of expanding their paid teaching staff and their commitment to hiring women of color as teachers and guest artists. “From the very beginning, our greatest champions have come from the science fiction community,” said co-founder and author Chana Porter. “N.K. Jemisin, Malka Older, Ibi Zoboi, Ann and Jeff VanderMeer, the staff of Tor.com— these members of the science fiction community helped make the Octavia Project possible.” Porter and McNamara went on to say that the Octavia Project was created to honor, support, and celebrate the imaginations of black and brown girls in Brooklyn, immigrant girls, and LGBTQ youth. The Octavia Project uses girls’ passion in science fiction, fantasy, fan-fiction, and gaming to teach them skills in science, technology, art, and writing, equipping them with skills to dream and build new futures for themselves and their communities. Their inspiration and namesake is Octavia E. Butler, who broke barriers in writing and science fiction to become an award-winning and internationally recognized author (Kindred, Lilith’s Brood). The Octavia Project is inspired by her visions of possible futures and commitment to social justice. VanderMeer interviewed one of the founders, Chana Porter, about the work of the Octavia Project for Electric Literature — “We Need the Alternate Realities Living Inside Girls of Color from Brooklyn”. VanderMeer: How do you use science fiction as part of the Octavia Project? Porter: Meghan McNamara, a science teacher and dear friend, saw the opportunity to teach science and tech skills through SF/F writing workshops I was leading with teen girls. 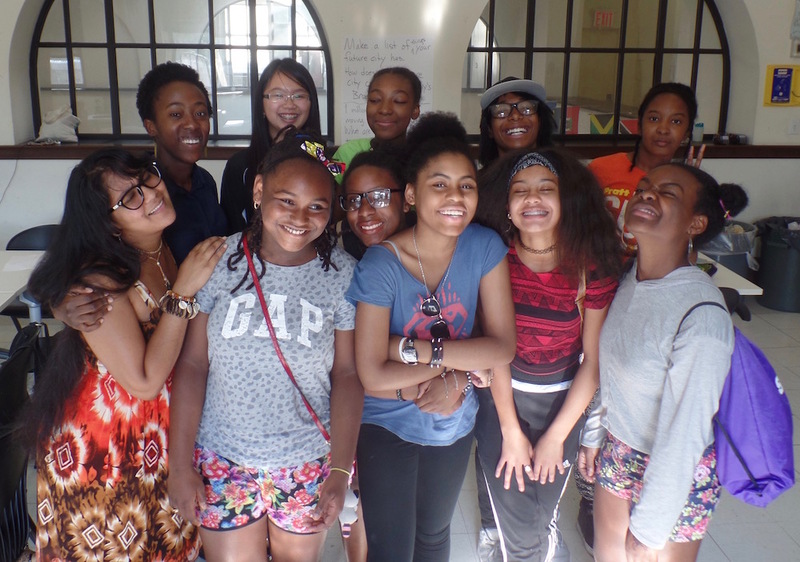 Over the course of the month at the Octavia Project, teen girls from Brooklyn write SF/F stories that are enriched by interdisciplinary projects. A SF story is transformed into a text-based computer game. The girls learn simple coding while building the game based around their story. The computer game is a branching narrative, and this changes the way the author has been thinking about her story. So she keeps writing, incorporating the new ideas she gleaned from the computer game project. The next day, a professional woman architect comes to teach the basics of 3-D modeling. The girl builds a cityscape from her imaginary world. Then we take it back to the page. Building her city has changed the way she thinks about her story. Every project is connected back to storytelling at the Octavia Project. The girl designs clothes and tools from her world, then uses basic circuitry and principles of electrical engineering to create wearable electronics based on her design. This causes her to think about how tools function in her story. She takes it back to the page. This summer our theme at the Octavia Project is “200 Years in the Future”?—?we chose this theme for a few reasons. First, it pushes our participants to think about what they want their futures and the futures of their communities to look like. We’re asking them a question “What do you want the future to be like?” and then we’re helping them build the skills to create the answer. While most people agree that scientific discoveries can make the world a better place to live in, we created the Octavia Project to help address the imbalance around who gets to benefit from current and future technologies. While most people agree that scientific discoveries can make the world a better place to live in, we created the Octavia Project to help address the imbalance around who gets to benefit from current and future technologies. Along with our theme, this summer we’re learning about the evolution of life on Earth. We are looking at how plants and animals have evolved to where they are today, and then we’re imagining what these plants and animals might be like hundreds of years from now. We’re asking how has life on Earth changed and what conditions or events have made it change. Octavia Project is a sponsored project of Fractured Atlas, a nonprofit arts service organization, and donations are tax deductible. This entry was posted in Heard Online and tagged Ann VanderMeer, Chana Porter, Jeff VanderMeer, Octavia Butler, Octavia Project by Mike Glyer. Bookmark the permalink.